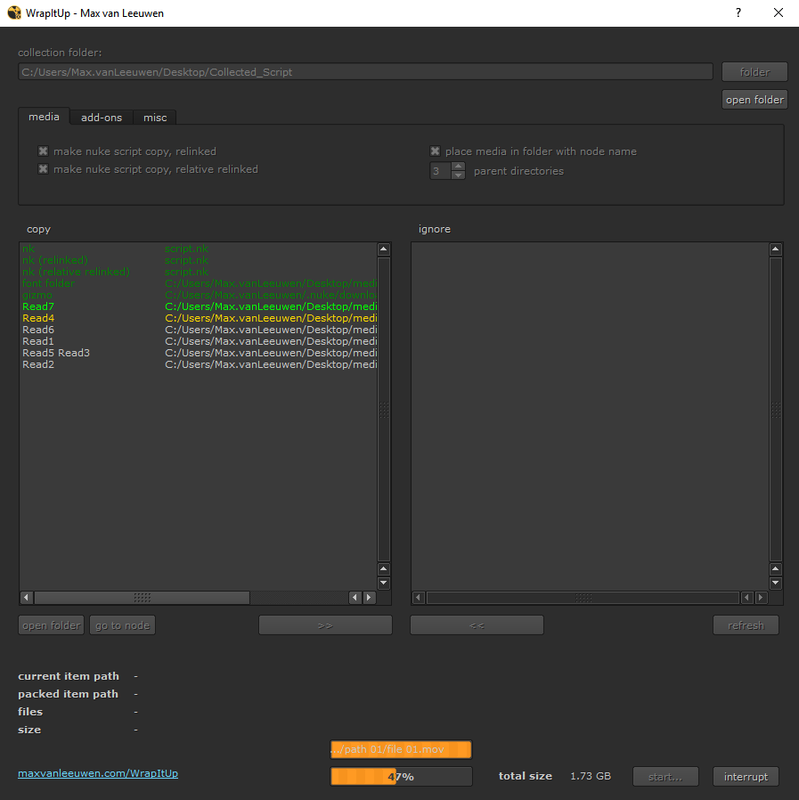 I made sure to cram the entire thing in just one Python file, so you can simply drag-and-drop the file it into Nuke’s script editor if you wish to use it just once. Tested on Windows, Mac and Linux (CentOS). The relative-relinked Nuke script will stay linked to its media, even if you move it to a completely different machine – as long as the media is right next to it. Media files with the path variables ####…, %**d (printf), %v and %V are supported. Go to your .nuke folder, and create a file called ‘init.py’. If such a file already exists, open it. If you are only running it once, you can simply drag-and-drop the WrapItUp/WrapItUp.py file into the script editor panel in Nuke and click ‘Run the script’. Place the WrapItUp folder in the ‘_AutoInstaller’ repository. First, choose the collection folder to which all collected files will be copied. Make sure this is an empty folder – this script will overwrite any pre-existing files. All settings are set to copy everything by default. Make another copy of the Nuke script in which all nodes that have their media copied over will be relinked. This way, the nuke script will keep working, even if it has been moved to a different location/machine – as long as the media files are right next to it. Place all media items in a subfolder with its corresponding node as that folder’s name. This helps finding which media belonged to which node in the new comp, and it is an extra measure against the kind of problems that could arise when parent folders of different media items have the same names. The amount of (empty) parent directories to copy over for each found media item. If the ‘place media in folder with node name’ checkbox is unchecked, do not make this number too small. Fiiles with same-name parent directories might end up overwriting, or merging together. If the current Nuke script has a custom Project Font Path set in Settings > Node, collect this directory. If custom gizmos are used in this Nuke script, collect them and generate an init.py and menu.py file that installs them on a different machine. This function does not work for all gizmos, as they can be dependent on other files. This does not work for plugins (.dll, .so, .dylib). Continue copying if an error occurs. If there are errors, check the log.txt file generated in the selected root folder. Close Nuke entirely when the copying process is finished (or on error, if ‘continue on error’ is disabled). Useful for machines that are licensed using a limited number of floating licenses on a license server. Set the log file’s CSV column separator. The ‘copy’ list (left) will show all items that will be copied to the new location. Use the arrow buttons at the bottom to move them over to the ‘ignore’ list, if these items do not need to be copied. Use the ‘Start’ button to begin copying all files. When the copying process has started, a progress bar will appear to indicate how much time it will take. As nuke scripts usually use many gigabytes of data, it could take a while. Leave Nuke open for as long as this process takes. If you want Nuke to exit at the end of the process due to floating licenses that might be needed elsewhere, check the ‘exit nuke on finished’ box. WrapItUp can be called as a start-up script for the Nuke command line, so you can run it inside a terminal/console/command prompt window. It is also a Python module that can be imported in a Python script or run from a Python shell. In both cases you will need a licensed Nuke installation on the machine you are running WrapItUp on in order for it to work. Use the instructions down below to run WrapItUp through command line or Python. As Nuke can be run from command line with a Python script attached to it, I made sure to support this for WrapItUp as well. This will start collecting files for the Nuke script “\\remote-storage\work\scripts\0001.nk”, to the folder “C:\Users\Max\Collected_Scripts\0001”. All media will be placed in a path of 10 parent directories deep. If you omit the -s in this line, the copying process will not actually start. Only a preview of what would happen will be printed. Simply import the WrapItUp module and call WrapItUp.WrapItUp() – without any arguments, this will open the user interface window. If the ‘out’ argument has been set (see list of arguments below), the UI will not show and the script will instead run silently following the arguments that were entered. Path to nuke script file (.nk) to collect. Default: current nuke script, if running in Nuke. Required: only if not running in Nuke. Starts the copying process right away. If false, running the function will only return a preview of which files will be processed. Place media in folder with node name. 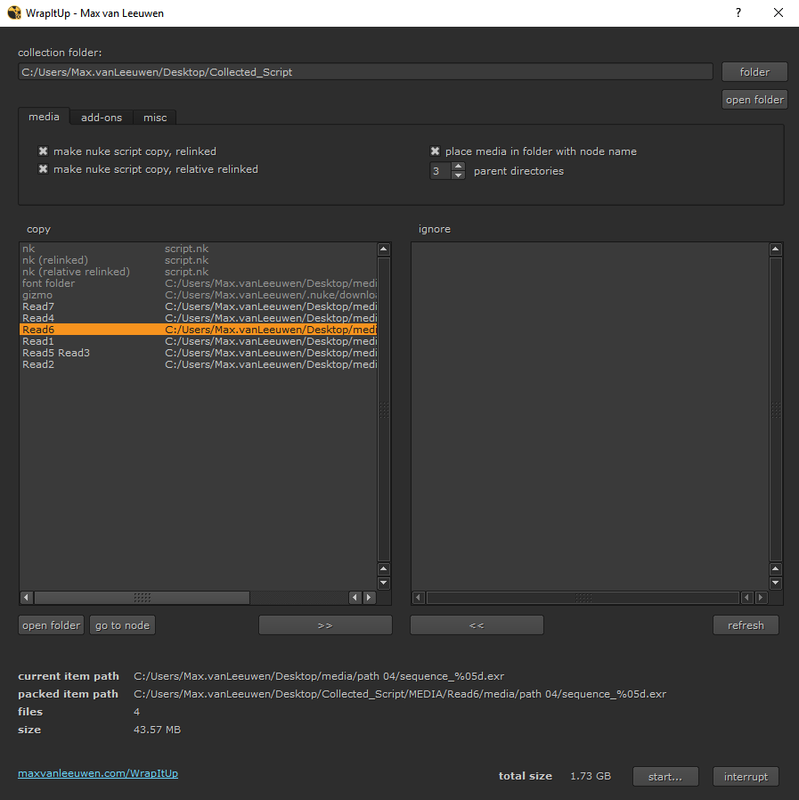 Make nuke script copy, relinked. Make nuke scrip copt, relative relinked. Copy fonts directory (if any). Set the log file’s CSV separator to commas instead of semicolons. This will collect the file /user/documents/nukescript/v001.nk to the folder /user/documents/collected, with 10 parent directories for each media item. If you encounter any problems with missing Nuke modules, make sure Nuke and Python are both added correctly to the environment variables.